General Sherman Reviewing His Army at Savannah. 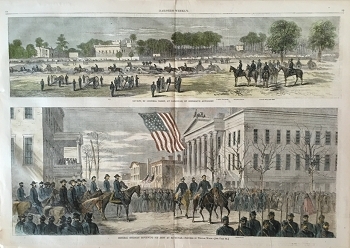 This nicely colored double page and double image shows troop reviews by Generals Barry and Sherman at Savannah. It is dated Feb. 11, 1865 and measures a page size of 15 3/4 x 22 inches. The paper and ink are original to the 1865 publication and the color is modern.